The first domino falls for the Grizzlies. More to come? The Particulars: The Grizzlies traded three reserve players — Marreese Speights, Wayne Ellington, and Josh Selby — and a protected future first-round draft pick to the Cleveland Cavaliers for reserve forward Jon Leuer. The pick can't be exchanged until at least 2015. The Rationale: This was foremost a financial move. It brings the Grizzlies under the league's luxury tax threshold without having to move any of the top seven players (assuming Darrell Arthur and Quincy Pondexter as the most valued reserves). What's Going Out: Maybe not as much as you think. Speights is a useful player whose real value is somewhat lesser than his surface stats, and he had rightly fallen to fourth in the team's big-man rotation. Ellington has had a couple of good games but is essentially a replacement-level player. Selby was a non-factor. What's Coming Back: Obviously, not much. But Leuer is a bit more than a contract throw-in. The 6'11", second-year forward was lauded by then ESPN.com columnist John Hollinger as an underrated draft prospect two years ago and panned out as quality role player for the Milwaukee Bucks last season. Signed by Cleveland and relegated to the franchise's D League affiliate, the Canton Charge, this season, Leuer has been productive, averaging 20 points and 12 rebounds on 51 percent shooting for Canton. Leuer won't rebound as well as Speights but has similar shooting skill and could surprise. Short-term Roster Issues: The trade brought the Grizzlies roster to 11 and left space under the tax line to make two minimum signings to get to the league-mandated 13 players. 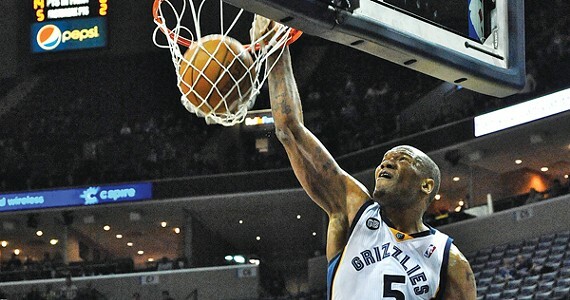 The Grizzlies made their first yesterday in signing 22-year-old spot-up shooter Chris Johnson out of the D League. The Grizzlies will have a roughly two-week grace period to sign one more player to bring their roster to the minimum 13 players. If the Grizzlies can get (Pondexter) and keep (Arthur) healthy, I think the short-term impact of this move is probably pretty minimal, regardless of what production Leuer, Johnson, or other new acquisitions provide. It also presents an opportunity for talented rookie Tony Wroten Jr. to accelerate his development. The risk — and it's a big one — is that the Grizzlies are now much less prepared to withstand injuries to their remaining rotation players. What It Means for a Bigger Deal: The national take on the deal was that the Grizzlies did it in order to preclude a bigger trade until this summer. But I wouldn't be so sure. The long-term payroll trajectory still strongly suggests a major deal before the start of next season, and there's reason to believe there could be better Gay deals available in the next month than in the summer, especially now. A Grizzlies source indicated that Tuesday's trade primarily takes the financial imperative out of larger trade discussions, giving the team the freedom — and roster flexibility — to evaluate offers in the coming weeks more fully in basketball terms. The Grizzlies still have an offense that's performed terribly over the past month and badly needs more shooting. But even affirmative answers to those questions won't change the two most troubling aspects of the deal: The stronger-than-hoped-for desire of new ownership to do away with their potential tax burden for this season and their willingness to sacrifice a future first-round pick to do so. 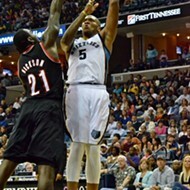 See Chris Herrington's blog "Beyond the Arc" at memphisflyer.com/blogs/beyondthearc for more.